The Howard and Phyllis Eisenberg Fund is an endowed fund held by Marquette University that provides law school loan repayment assistance to qualifying Marquette University Law School graduates who enter public interest careers. 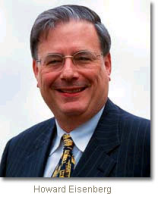 Dean Eisenberg established the Loan Repayment Assistance Program (LRAP) in the spring of 2001. After his death, the program was renamed to serve in his legacy and was enhanced through memorial contributions and other donations. The Law School recognizes that the legal community has a responsibility to help provide services to people who cannot afford representation. This program has been adopted in the hope that it may remove an obstacle to graduates interested in choosing a career serving the poor and underserved. The loan amount is equal to fifteen percent of the difference between the past year's MULS graduating class' median starting salary and the gross income of the applicant as adjusted in accordance with LRAP policies and the applicant's financial circumstances, not to exceed the total of loan payments the applicant actually makes during that year. Of course, the amount of funds available for LRAP may not equal the needs of all qualifying applicants, and in all events the Law School has discretion to determine the recipients of funding and the funding levels.